Top Question Answered: Which 10-S Linesman Line Sweeper Do I Go With? 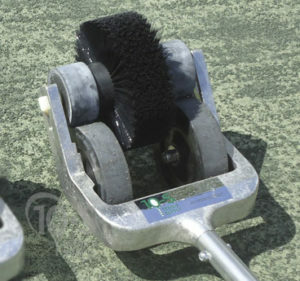 Here at 10-S Tennis Supply, a very popular question we respond to is “Which is better to sweep the lines of my clay court – the Fine Bristle or Stiff Bristle Linesman?” While both of these “Line Sweepers” will get the job done, we will typically recommend one over the other. After any type of play or maintenance to a clay tennis court, you will inevitably find that there is a fair amount of clay scattered across the top of your white lines. 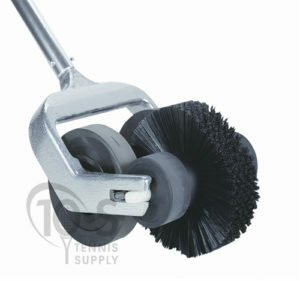 Years ago tennis maintenance tool designers developed the line sweeper to focus that sweeping / cleaning motion solely on the lines to sweep the lines clean. The active part of these sweepers are on the bottom end of a long handle and consist of four hard roller wheels spaced perfectly on each side of the white tennis line. Then in the middle, a circular brush rolls across the top of the line, simultaneously kicking off the clay, and brushing the line clean, much like a broom. As you push forward, the wheels turn and the brush turns, giving the line sweeper the momentum to clean the lines with ease – giving the court a freshly groomed look. After the initial design of the line sweeper – it evolved to give people two options of brushes to choose from: Fine Bristle or Stiff Bristle. Let’s examine each of those a little closer. The 10-S Linesman line sweeper with Fine Bristles has a positive locking action and a textured brush for an easy-to-use, yet firm brushing action. It is constructed of aluminum for years of rust free use. Assembled with fine / soft brush. Click here to see the Fine Bristle Linesman in action. The 10-S Linesman line sweeper is the most popular line sweeper on the market. The 10-S Linesman has a positive locking brush action and a textured coarse/stiff brush for an easy-to-use, yet firm brushing action. It is constructed of aluminum for years of rust-free use. Replacement brushes and parts available. Click here to see the Stiff Bristle Linesman in action. Now the big question – WHICH DO I GO WITH? While both of these line sweepers will “do the trick”, it has been our experience over the years that more people prefer the Fine Bristle Linesman. While one may be inclined to think the Stiff Bristle brush would do a better job cleaning the lines, it can actually “catch” and skid across the lines and miss a fair amount of the clay you are trying to remove. Which is why we recommend the Fine Bristle Linesman. We have a fair number of customers that are “believers” in the Stiff Bristle Linesman – and choose that model each time, but when at a crossroads, we will most often recommend the Fine Bristle based on years of feedback and real world testing. So there you have it – one of our most popular questions answered.